"And for some reason, I got blue hair. You gotta have blue hair." — Strong Bad (describing his anime counterpart, Stinkoman), Homestar Runner, "japanese cartoon"
Though there are plenty of ways to differentiate characters from each other, one of normally limited utility is hair color. Human hair has a limited amount of variation, after all, not enough to make everyone on a half hour show once a week easily distinguished. Thus, this trope was born, so that artists could use the full spectrum of color. It's so common that it's mostly considered an Acceptable Break from Reality now. This is especially common in anime, where characters often have impossible hair colors (and no, they're not a result of dyeing; they're completely natural even down there). This started with manga series that used distinctive colors on the covers to make characters stand out, even though they all had either dark or light hair in the actual black-and-white pictures; anime brought it to the screen and made it a standard part of character designs. There are several reasons why artists do this. The first, noted above, is to help distinguish characters from each other especially if their designs are highly stylized and simplified, as with Anime Hair, and other features such as eye shapes, eye colors, tattoos, scars, accessories. It may be done to indicate character personality, such as an Emotionless Girl with blue or white hair. It may indicate that a character is unique, if they are the only one in the cast with their hair color. Or it may be done just to suit the artist's taste for variety. In some cases, artists may use Power Dyes Your Hair to explain how a character gets unusual hair when otherwise trying to be realistic in their hair color choices. Also not uncommon is that the Curtains Match the Window. Some specific colors have Sub Tropes which ascribe certain character traits to them: such as a blue-haired girl being shy, a pink-haired girl being cheerful or passionate or sweet (take your pick), and a white-haired young-man being evil. A subtrope of Hair Colors. Hair Color Dissonance is when hair is depicted as an odd color, but is supposed to be a normal color (e.g., powder blue standing in for grey); specifically, when hair of a very dark shade of blue or purple is supposed to represent black hair, that's Purple Is the New Black. When the hair color is realistic but is not justified by the setting, that's Implausible Hair Color. For characters with impossible hair styles, see Anime Hair. See also Amazing Technicolor Population and Mukokuseki. Erin of the Erin Esurance commercials has pink-colored hair. In Happy Heroes, Cockroach, a girl from planet Gray who first appears in episode 29, has light blue hair. In the PangPond episode "PangPond in Love", PangPond falls in love with a girl who has green hair. Blue of Say Hi to Pencil!, befitting of his name, has blue hair. Simple Samosa features Dhokla, who has a tuft of green hair on top of his head. Some of the girls in Yandere No Onna No Ko have strange hair colors. Sonoko and Iori have purple, Yumemi has pink, and Tomoe seemingly has white. A few of the guys in Yandere Heaven possess odd colors while the rest have black, brown or blond hair. Atsushi and Ayumu have green, Kakeru has purple, Minase has silver and Katsumi has lavender. Used for comedy in The Lockhorns. While the couple passes a woman with literal blue hair, Leroy mutters "Remember when blue hair meant being old?". Sedine from InSecurity sports a bright shade of purple. In Banzai Run, Blue Beard's hair is a very light electric blue. Annie from Asteroid Annie and the Aliens has green hair for some unspecified reason. Die from the Cool Kids Table game Creepy Town has purple streaks in her hair. Very few Monster High characters have human hair colors, and if they do, it's not their only color. The Purr-Tenders toyline is an example of You've Gotta Have Pink Fur... and lavender, and bright yellow. The Golden Books showed they weren't the only ones with odd-colored fur; the cats came in all colors of the rainbow. Most of the Hairdorables characters have brightly colored hair; the main character, Noah, has blue hair and blue eyes. Only about a third of them have semi-natural hair colors at all: Kat, Skylar, Bella, and Brit—and starting in Series Two Brit drops the semi-natural brown for fully pink. The Trope Namer, Homestar Runner, spoofs this when a fan named James asks what Strong Bad would look like as an anime character. Strong Bad decides that he'd be shiny and have huge green eyes, cooler boots, and blue hair ("You gotta have blue hair. "), for some reason. Humourously, on one main page, scrolling over "Store" gives 1-Up (Homestar Runner's anime counterpart) blue hair. Acedemy Sugoi Seiun has characters with bright pink, blue, yellow/orange/red (at the same time), and purple hair. Eddsworld had Laurel, a one-time character in the "Movie Makers" episode. Gwain Saga: The population of the Kingdom of Gwain all have technicolor hair. And eyes as well. Nikki from Camp Camp has mint-green hair, as well as pink technicolor eyes. This is odd, given that other than her and her mother, no other character has odd hair or eye coloration like this. DSBT InsaniT: Bill and his sister, Whitney, are the only members of the main cast with unnatural hair colors. He has blue hair and she has pink. Dreamscape: Vampire Lord has teal hair. Melissa has purple hair, but 'Confronting the Dark' reveals she was a redhead before she joined Melinda, who has purple hair naturally. The tip of Nik's hair is red. The blue and red fairy of Eleenin's Fire, Ice, Lightning fairy trio have, well, blue and red hair. La Golda: Ms. Ricca's hair is green, and Sonya's hair is blue. RWBY: On the world of Remnant, people honour the memory of a terrible global war that sought to suppress individuality and artistic expression by naming children after colour associations and letting people express their personalities through clothing styles, hair dyes, and other forms of artistic expression. As a result, a number of characters have impossible hair colours. 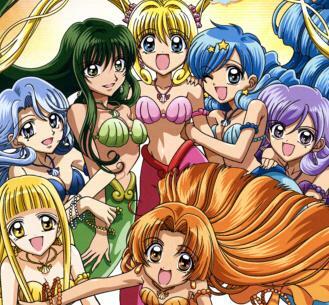 Characters that have Implausible Hair Colour can be found under that trope. Doctor Oobleck is Beacon Academy's history teacher. He has a shaggy, unkempt mane of vivid green hair. Emerald Sustrai has mint-green hair, in keeping with her name. Neopolitan is named after the ice-cream of the same name. She has a tri-colour theme to match. Her hair is therefore half pink and half chocolate brown. In the pink half of her hair, there are streaks of white. This actually matches her eyes, which naturally default to one pink, one brown eye, but which turn white when she's afraid. Ciel Soleil, who has a sun-and-sky theme, has very dark blue hair that borders on blackish-grey. Nebula Violette from Team NDGO has violet coloured hair. May Zedong from Team BRNZ has magenta-coloured hair. Depending on lighting, it sometimes can look either pale purple or dusky pink. Russel Thrush from Team CRDL has a punk theme and a green mohawk to go with it. From Team SSSN: Neptune Vasillas light blue hair, which goes with his heavy water themes. Sage Ayana has very dark green hair, similar in colour to the plant. From Team ABRN: Reese Chloris has mint-green hair, which matches her eyes. Nadir Shiko has bi-coloured hair: predominantly pink with very dark side-cuts. Richie in Recess Reindeer has blue hair to match his blue body. The celebrated "Glowing Green Monkeys", who were created by gene-splicing lab monkeys with bioluminescent sea creatures. Their hair only glows under fluorescent light, however, and looks more of a dull greenish-brown under normal conditions. Bioluminescent pigs, on the other hand, are bright yellow . A potential result of overexposure to cobalt or indigo dyes during industrial processes. Purple squirrels have been showing up around the world. Whether or not it's some sort of prank is unknown. Maybe it's a commentary on the job market. Can be invoked using hair dye. Can be unintentionally invoked using hair dye, particularly if your hair is fair and/or highly absorbent. For instance, it's not unknown for temporary black hair dye, when being washed out, to turn blonde hair green for several days. In 2001, Cricketer Colin "Funky" Miller celebrated Australia's Centenary of Federation by dying his hair in what he referred to as "Federation Blue". The famous green cat that became a internet sensation. It turned out it had been regularly sleeping on a can of green paint over a long enough period to eventually completely coat itself, and it was eventually washed by animal rescue because of concerns about it's safety, as ingesting paint can hurt cats.